I've been taking photos at WWII reenactment events at Camp Mabry for a few years now. After accumulating a good number of images I have decided that it is finally time to do something special with them. My main reason for shooting at these events is to give something back to these guys. Owning and caring for genuine period uniforms, weaponry, and vehicles is really expensive and nobody pays these folks to present these programs. These people do what they do because they are passionate about presenting living history lessons. It's not about running around with guns and glorifying war. It's about educating the public about the harsh realities of war and the tremendous sacrifices that are made in defense of freedom. I have put some of my favorite images from the Close Assault WWII reenactment events into a small book. It is a 44 page paper back. I've donated several copies to the Texas Military Forces Museum for sale in their gift shop so that they can use the proceeds to help fund programs like Close Assault. The book is also for sale online. I will donate all profit from online sales of the book to the museum either directly in cash or I will use the profits to purchase more copies of the books to donate for sale at the museum. Either way, I'm not making a cent - all the money goes to supporting living history programs at Camp Mabry. A number of people have asked me about purchasing my images in books and I'm happy to finally have something available. Please consider picking up a copy and supporting the living history program at Camp Mabry. I'd sure appreciate it and I know the great people of the Living History Detachment would as well. Just click the link below to purchase. Thanks! 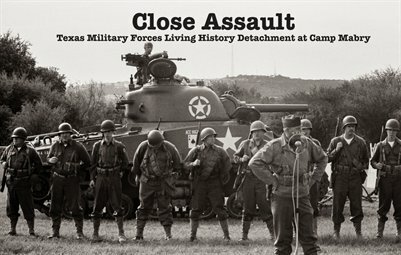 Photos from the Close Assault WWII Reenactment events at Camp Mabry in Austin, TX. These events are put on by the Texas Military Forces Museum's Living History Detachment. This book includes portraits and battle photos.